Like most noteworthy organizations and group efforts, the Hispanic National Bar Association was founded in times of adversity. It was a conscientious response to the increasing struggles and questionable burdens facing the Hispanic community in the United States. The year was 1971, and the landmark decision, Brown v. Board of Education, 347 U.S. 483 (1954), was still leading civil rights litigation across the United States. The civil rights of Hispanic students had been implacably violated long before. In a small town outside of Los Angeles, California, ten years before Brown, Silvia Mendez the daughter of Mauricio Mendez, a Mexican immigrant and a Puerto Rican mother, and other children of Mexican descent were banned from the predominantly white schools of Westminster School District in Orange County, California. The Mendez family together with the Palomino, Estrada, Guzman and Ramirez families, filed a class action lawsuit in 1945 on behalf of 5,000 Mexican-American children in Orange County calling for the integration of the schools. The plaintiffs in Mendez v. Westminster argued that student segregation into separate schools in Orange County was based solely on their national origin. The 9th Circuit acknowledged that the segregation of Mexican and Mexican American students into “Mexican Schools” was unconstitutional. Mendez v. Westminster School District, 64 F.Supp 544 (C.D. Cal 1946), aff’d, 161 F. 2d 744 (9th Cir. 1947.) Swann v. Charlotte-Mecklenburg Board of Education, 402, U.S. 1 (1971) was decided by the United State Supreme Court, dealing with student busing to promote integration in the racially imbalanced public schools. During this time, race riots were intense across the land; prejudices and discrimination were abounding. The Civil Rights Act of 1964 was effecting change. The country had been at war in Vietnam since 1959, with U.S. involvement spreading into Southeast Asia, Laos, Cambodia and Thailand. The United States was reeling with anti­war sentiments and demonstrations were held in major cities including Washington, D.C. and San Francisco, CA. America’s mainstream youth were uprising; the “Summer of Love” flower-power movement was at its height. The 26th Amendment to the United States Constitution, the Right to Vote, was certified, lowering the voting age from 21 to 18. Lewis Franklin Powell, Jr. and William H. Rehnquist were nominated to the Supreme Court by President Richard M. Nixon. The injustices and number of abuses against Latinos were escalating; it became evident that a greater more sustained legal challenge was necessary against the blatant racism. In Texas, Pete Tijerina, Civil Rights Chairman for San Antonio’s LULAC Council No. 2, had been fighting the discrimination struggles of Latinos for a number of years. A committee of three, Pete Tijerina, Bexar County Commissioner, Albert Pena, and former San Antonio City Councilman, Roy Padilla, met with the FORD FOUNDATION seeking funding to form a Mexican American civil rights organization to address the mounting problems of Latinos in the Southwest. They succeeded. Funded by an initial grant from the FORD FOUNDATION, the Mexican American Legal Defense and Education Fund (MALDEF) was launched in 1968 in San Antonio, Texas. MALDEF resolved to advance public policies, laws and programs geared at safeguarding the civil rights of Latinos living in the southwest United States, later expanding across the nation. The original MALDEF member states were Texas, New Mexico, Arizona, California and Colorado. By 1971, MALDEF relocated to San Francisco, California. In November of 1971 the United States Senate Committee on the Judiciary began interviewing William H. Rehnquist to be the next Associate United States Supreme Court Justice. The lawyer members of MALDEF strongly opposed Justice Rehnquist’s appointment on various grounds of discrimination based on reported actions taken and comments made by Mr. Rehnquist against the civil rights of minorities. The MALDEF lawyers also sought the appointment of a Latino to the United States Supreme Court. Knowing that the Committee on the Judiciary would only recognize a legitimate organization, they founded LA RAZA NATIONAL LAWYERS ASSOCIATION (LRNLA). The first ad hoc meeting of LRNLA occurred in San Francisco, California in November of 1971. Their immediate intent was twofold: first, to voice their objection to the William Rehnquist nomination by President Richard Nixon, while concurrently submitting the name of Judge Reynaldo G. Garza, a well-qualified nominee as the first Latino to the United State Supreme Court. In 1961, Judge Garza was the first Mexican-American to serve on the federal bench, appointed by President John F. Kennedy. A Western Union Telegram on behalf of LRNLA was crafted, signed by each founder and transmitted to President Nixon and the U.S. Senate Committee on the Judiciary. LRNLA called for the withdrawal of William Rehnquist nomination under allegations of racism. Rehnquist was brought to task during his Senate confirmation hearings for his attitudes and actions while in Arizona against Hispanics, Native Americans, Blacks and other ethnic minorities. Despite the Committee on the Judiciary questioning regarding his attitude about the civil rights of minorities, William Rehnquist was sworn in January, 1972. In the same telegram, the LRNLA submitted the name of Judge Reynaldo G. Garza for nomination as Associate Justice of the Supreme Court. In due course, Judge Reynaldo Garza was nominated by President Jimmy Carter and was elevated to the Fifth Circuit Court of Appeals in 1978. Judge Reynaldo G. Garza passed away September 14, 2004, having served with distinction on the U.S. Court of Appeals. The first official LRNLA Board of Governors meeting took place in San Francisco, California, on October 7, 1972. LRNLA incorporated as a California non-profit organization. LRNLA founding members are: Mario G. Obledo, Hon. Cruz Reynoso, Louis Garcia, Miguel Angel Mendez, Al Gonzalez, Hon. 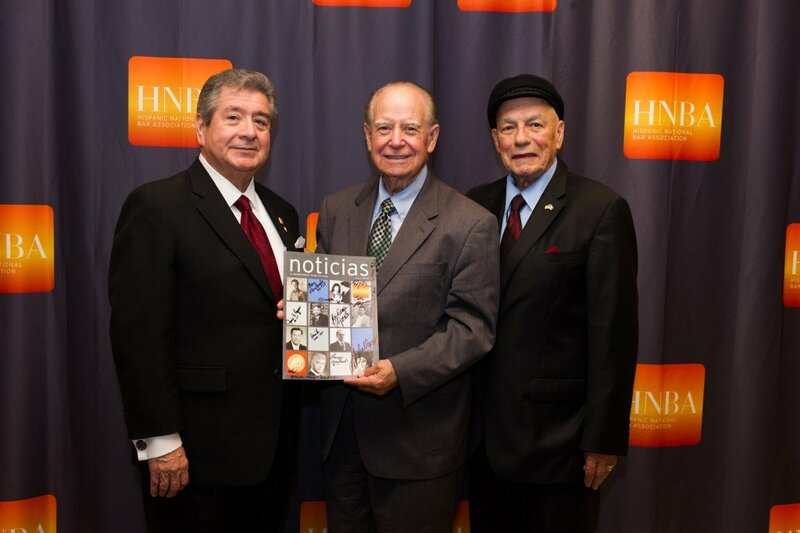 Lorenzo Arredondo, John Huerta and Donato Tapia. During this time, existing legal aid programs, initiated and funded by grants during President Lyndon B. Johnson’s “Great Society” war on poverty, were under strong political opposition. Conflict arose when the legal programs representing the poor brought litigation against local and state governments. One program at risk was the California Rural Legal Assistance Inc. (CRLA), founded in 1966, which provided legal assistance to those without access to public benefits, focusing on typical legal problems inherent in poverty. CRLA was a strong advocate for Latinos. The Office of Economic Opportunity (OEO) appointed an independent commission to investigate CRLA. Later, CRLA was absolved of all charges and federal funding was subsequently reinstated. To ease the increasing controversy regarding legal services programs and the local governments, change was called for by President Nixon. A national strategy was adopted by the Nixon Administration and federal funding decisions were removed from state politics. The Legal Services Corporation Act of 1974 transferred the Office of Economic Opportunities (OEO) Legal Services Program to the newly created, separate non-profit Legal Services Corporation (LSC). The Legal Services Corporation became the regulatory agency with oversight of legal aid services. In an effort to achieve veritable independence, the LSC was governed by a nonpartisan board of directors drawn from a wide range of individuals. An advisory council was established including representatives of the organized bar and clients. It was believed that other national bar associations such as the ABA and the National Bar would have representation at LSC. The MALDEF lawyers recognized a further need for a national Latino bar association and the formation of LRNLA was sealed. Boalt Hall Law School in Berkeley, California hosted the 1972 Spring La Raza Law Students Constitution Convention. Latino students attended from California, Texas, New Mexico, and Arizona law schools, as well as from Georgetown University, Yale and Harvard law schools. From its inception, connecting with Latino law students has been a priority for Latino lawyers. LRNLA membership increased as they joined with La Raza law students in an outreach effort utilizing the Hispanic Law Student mailing list. At the time, Latino law students lacked access to various educational funds and services only available on a national level. This was a principal frustration to Latino law students, law professors and Latino lawyers. LRNLA met the requirement of being a “national” organization advocating for the concerns of a nationwide population of Latinos. They actively sought and obtained educational opportunities for Latinos via scholarships and other assistance from national funding organizations. Together with LRNLA, the law students gained access to the boards and meetings of national funding organizations. In collaboration, LRNLA and La Raza Law Students focused on increasing the number of Latinos in law schools across the country and employment opportunities for Latinos following the bar exam. The alliance between Latino law students and lawyers continues as a fundamental strength of both organizations. It has become a natural transition from law student to members of the bar and the HNBA. Today the HNBA Law Students Division has its own executive committee that governs the law students’ active role in the HNBA, attending the quarterly board meetings, the HNBA Annual Convention, the HNBA Corporate Counsel Conference and the HNBA Uvaldo Herrera Moot Court competitions, among other activities. From its formation, the LRNLA met regularly to address the increasing legal problems and concerns of Hispanics in America. In particular, as the Chicano/Mexican Civil Rights Movement raged on, the LRNLA persevered in the legal battles over education, housing, voting, employment, union organizations, politics, the judiciary and other areas. Mario Obledo the first president of the organization served from 1971 through 1976. The organization continued growing in numbers, becoming firmly rooted in the legal community. In 1973, the First Annual La Raza National Lawyers Convention was held in Albuquerque, New Mexico. At the time, there was an estimated 3000 total known Hispanic lawyers in the country. The Honorable Benjamin Aranda III took over presidency from 1976 through 1980. 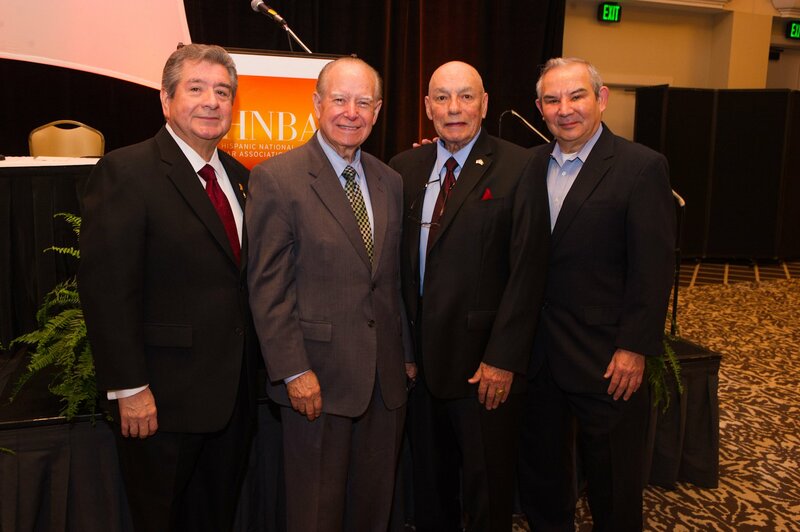 In 1981, the organization regrouped and changed the name to LA RAZA NATIONAL BAR ASSOCIATION (LRNBA). Thereafter, leadership of the organization changed on a yearly basis, following a vote of the membership. LRNBA Conventions in the early years were held in California. The conventions are now held on an annual basis in various cities. In 1984, the organization was renamed the HISPANIC NATIONAL BAR ASSOCIATION (HNBA) and moved the organization offices to Washington, DC.